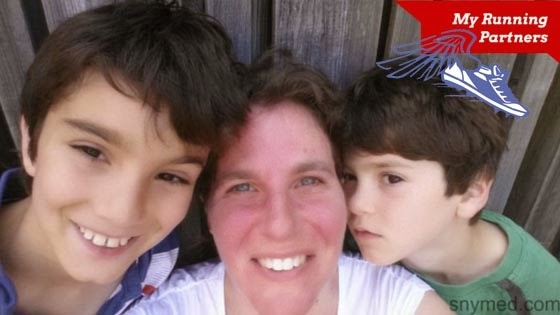 After a 3 km Run With My Running Partners: 9- and 7-Years Old! A short while ago I wrote about running and overcoming the monster in my mind. 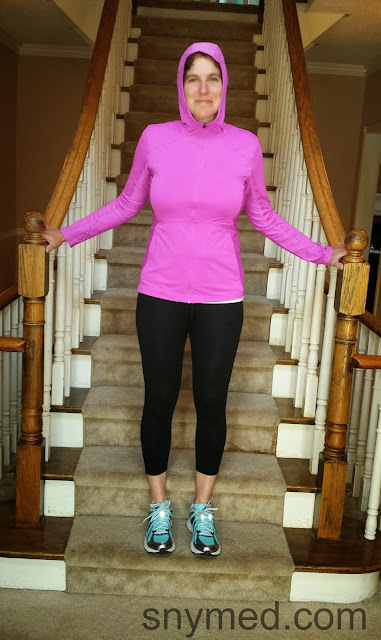 On numerous occasions I have also written about my health and fitness journey, and how I have lost 80 lbs and kept it off--now for almost 2.5 years. My ideology has always been to incorporate my family into my healthy lifestyle, and ensure that everyone is eating nutritiously, exercising regularly, and receiving the personal support that each family member deserves. My 9-year old son and I run regularly together as a team. I taught him how to keep a steady running pace, conserve his energy so he can make it to the "finish line", know his running position relative to me (so we don't trip over one another), talk less during runs, and to know that--above all--he can do it! He has succeeded in each and every of these counts spectacularly. I had also done some running with my then 6-year old son, who is now 7-years old. He is a super-fast runner, but has not yet learned how to pace himself, conserve energy, and run in formation with other runners. I am in the process of teaching him distance running, starting at 3km. This past weekend I threw caution to the wind, and decided to take both my 9- and 7-year old boys on a run. Adding my younger son to the mix, I knew there would be kinks to iron out--but that it would be worth it. One such kink included a brotherly quarrel, as my younger son repeatedly broke formation and infringed on my oldest son's running territory. To smooth things over, we simply reminded the younger son of his designated running area. This will take some practise. It was also a challenge to keep my younger son running, when he would tire and suddenly fall back several metres. To remedy the situation, my older son and I would jog on the spot until my younger son caught up with us, and encouraged him on with positive sentiments. We even let him overtake us, so he would feel like the pack leader. It is always at the end of the run that I have to strongly encourage my boys forward, tell them that they can do it!, and that the "finish line" is so near. Last weekend was no exception, and at the end of the 3 kilometre run, my younger son was especially tired, although the "finish line" was yet so near. I call this point in the "race" our "victory lap", because the end (and success) is so close that you can feel it. "Home home, going home. Home home, almost home. Home home, we are home." He repeated them, and the same rhyming system seemed to put him back on track. As we neared our home, we joined hands and finished the remaining distance together. The physical contact--a mother's hand extended to his--seemed to really help him and encourage him on, and I'm proud to say that all three of us successfully completed the 3 km run together! 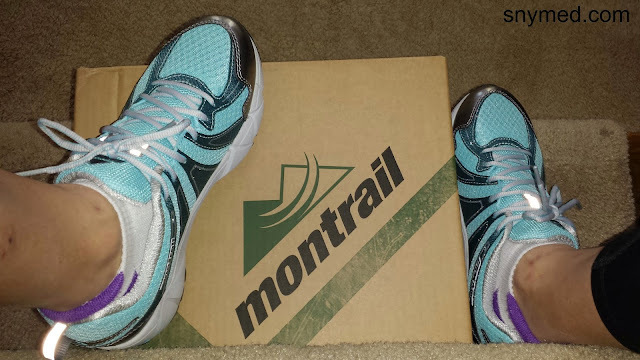 This was my first run ever in which I tried out Montrail Fluid Feel III running shoes in "Clear Blue, Cool Grey" colour, and I was very impressed! My first impression was that the heels seemed to be filled with some kind of squishy gel, and my feet felt marvellously cushioned. Although the shoes did not come in a half sizes, I chose a half size up and the fit was great. The shoes were instantly comfortable for me (no chaffing, blisters, etc), and there was no "wear-in" period, in which I had to break in the runners. Also, maybe silly to say, but the laces did not untie. As a runner who does not like to stop and break pace, this was a big plus for me. My feet were very comfortable during the run, as well as afterwards during the recovery period. 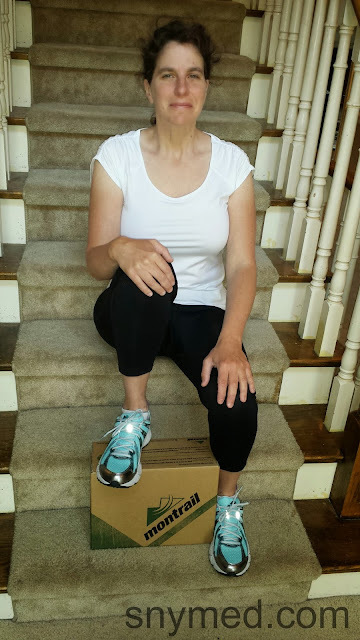 I ran all of last summer in Columbia Sportswear's Zero Rules short sleeve shirts, and absolutely loved them! 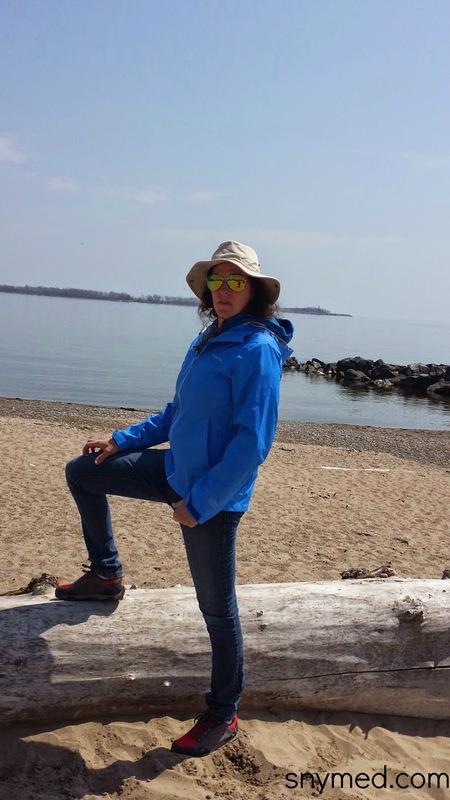 To try something new this year, I wore the PFG Zero Women's Short Sleeve Shirt in white, which was soft to the touch. It's a tech shirt with sweat-activated cooling, which I really enjoyed, as I despise getting hot (see my beet red face in the very top photo)! I found the ruched sleeve very flattering, and the fit to be a bit generous and flowing, which wasn't a big deal. Mark my words, I plan on adding more PFG Zero short sleeve shirts to my active wear wardrobe in different colours! Columbia's Women's Trail Bound Capri Tight in black was also a winner, which offered a lot of support. I liked the thick band around the waist, which sits flat over the tummy and does not dig or rub. I liked that the pant featured a cropped length, which helped me from overheating. This is definitely a great essential piece for any athletic wardrobe. For warm up/cool down, I had the Women's Trail Crush Sporty Hoodie in groovy pink. Impressive to me, is that it's UPF 30 and protects from harmful UV rays. I did find the fabric a little bit flowing on me, even with an under layer, but I have no complaints. Better a little roomy then too tight, I say. Do you mentor your kids or grand kids in sports, music, or other life lessons? Do you remember a mentor that was important to you as a child, or encouragement that you received that pushed you forward? Visit Scenic Caves This Spring or Summer! Caves, Suspension Bridge, Treetop Walking, Ziplining & More! 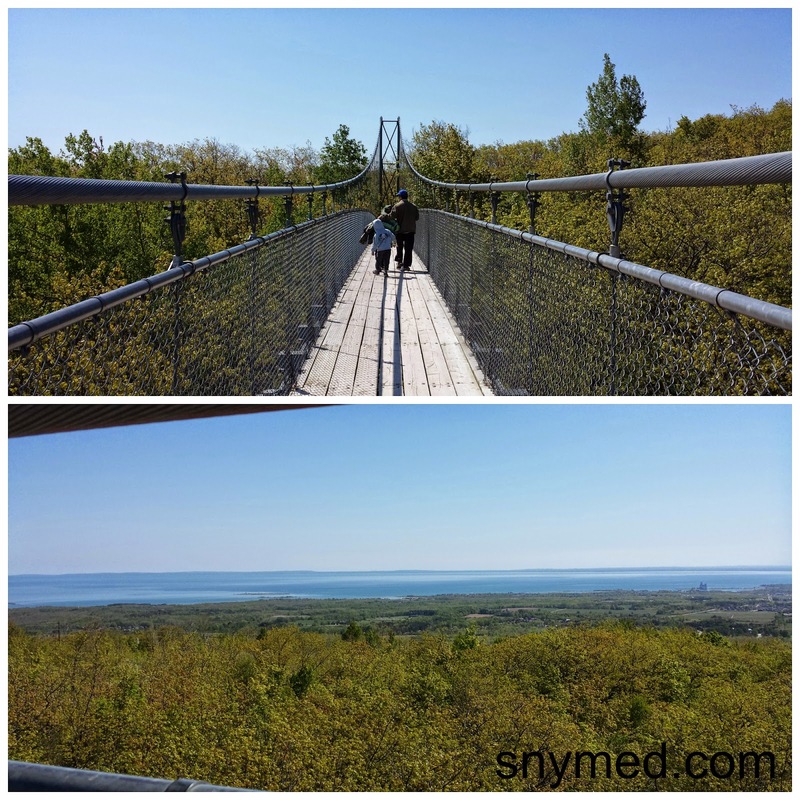 We recently discovered Scenic Caves Nature Adventures in Collingwood, Ontario. 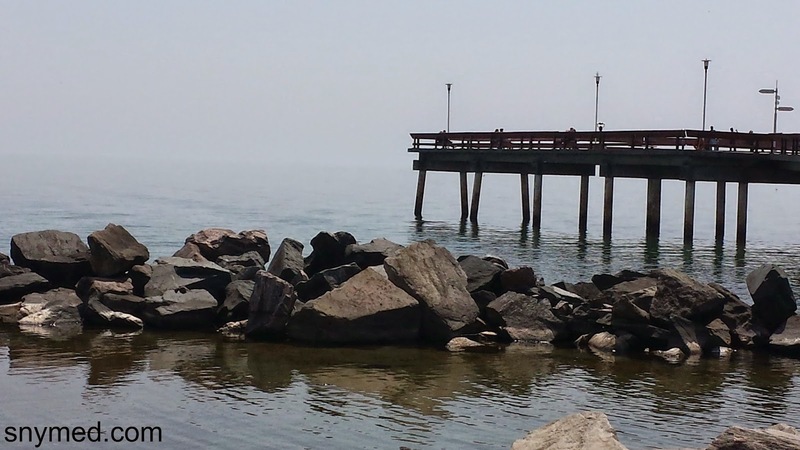 It's super close to Blue Mountain, and a heartbeat away from Wasaga Beach. Although they offer activities appropriate for ages 10 years and up (definitely bring your teens! ), such as treetop walking, zip lining, and cave and crevice exploring, there are lots of other activities that a young family can do together. 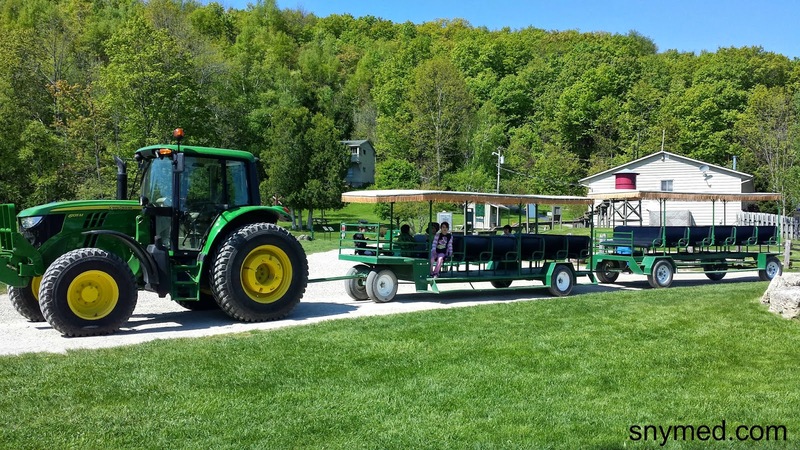 The family activities include a visit to the 420' Suspension Bridge, a train ride, a tractor ride, gemstone mining, trail hiking, mini golfing, picnicking, feeding salmon in a pond, and playing on the fun Scenic Caves playground. Stay all day, or stop by to cool off at Wasaga Beach on the way home! If you are thinking of visiting, you must wear closed shoes like sneakers or hiking boots (no crocs or open-toed sandals allowed). A sun hat in the spring and summer is a must, as well as a light jacket to keep you warm (and clean), while exploring the caves. Although the caves are lighted, do bring a flashlight if you want to explore unlit corners. If you are pregnant, infirm, babywearing, or with very young children (4 years or under), I would recommend that you avoid the cave segment of the visit. 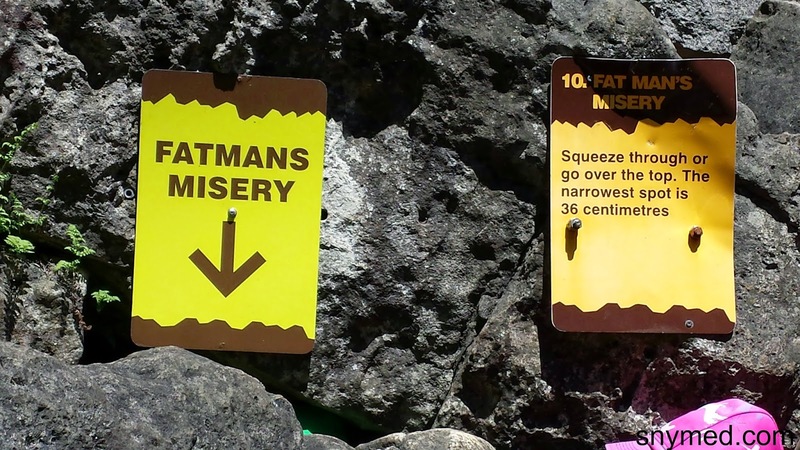 Portly visitors should skip "Fatman's Misery", or risk getting stuck like Pooh Bear in Rabbit's burrow! As an adult who loves to explore, I was most excited to start our family adventure with a self-guided tour of the caves. I thought that the caves were fantastic, including an "ice cave" that would have acted as a prehistoric person's freezer, and a 36 cm crevice that had to be circumnavigated sideways! 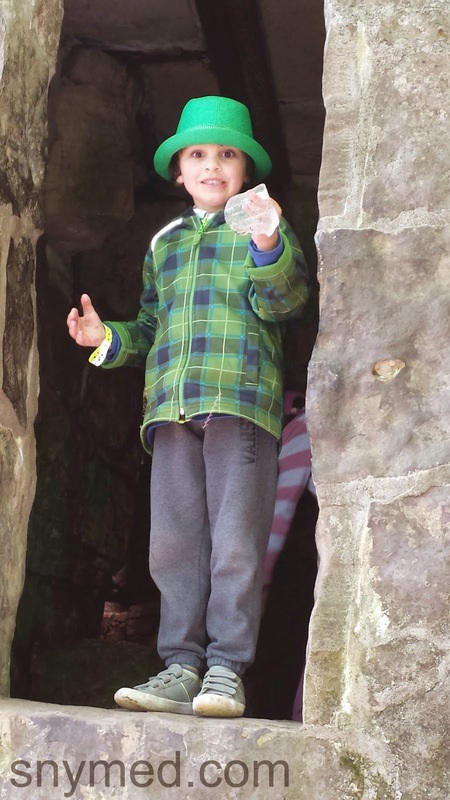 Ice Chunk Found In The Ice Cave! 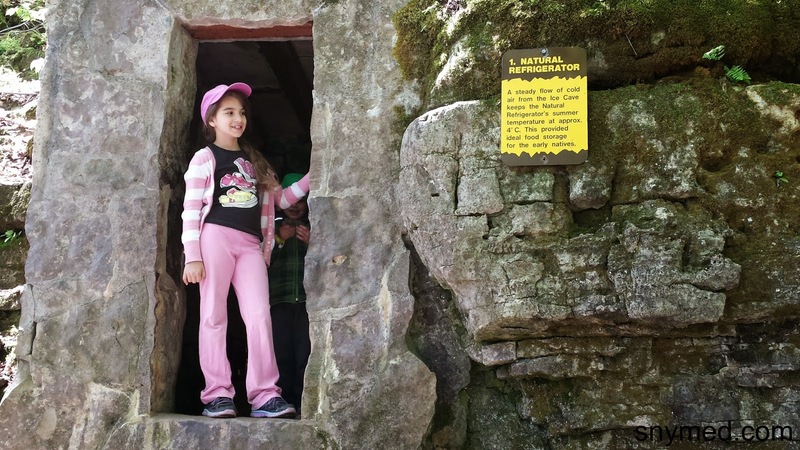 If you are portly, fearful of the dark, claustrophobic, have a large backpack or are visiting with very young children, I would recommend that you bypass cave #10 called "Fatman's Misery". One feature of this cave is a crevice measuring only 36 cm (14") wide. My 6-year old cried because he was scared to squeeze through, which in turn scared my 4-year old. This was no problem, though, and we simply left the cave the same way as we had entered. If you love an adventure, though, turn yourself sideways and squeak right through! My older kids and husband thought it was a hoot! 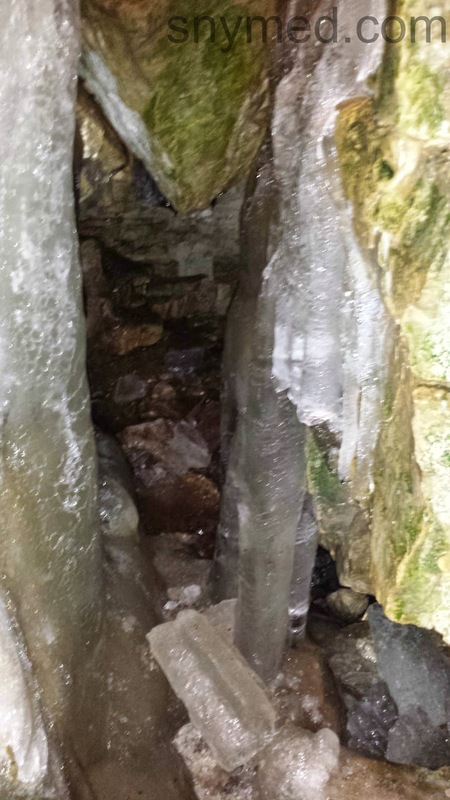 The Narrowest Crevice, "Fatman's Misery", Was Only 36 cm Wide! I only wished that were more caves to visit once we were done. Our group consisted of our five kids, ages 4- to 9-years old and two adults. I would recommend the cave component of the visit for kids ages 6 and up, due to some trail hazards and one crevice that was frightening for my own children (Fatman's Misery). Once the cave component is complete, there is a great aerial view of Georgian Bay, as well as a nice nature walk back through the Niagara Escarpment. Every 20 minutes to the left of the gift shop, a fun tractor ride takes Scenic Caves visitors on an excursion to the Suspension Bridge (and back). You can also walk there on foot, but if you have kids don't miss the fun! If you can overcome any fear of heights, I would highly recommend that you visit Scenic Caves' 420 foot wide Suspension Bridge! It affords a great 10,000 sq. km. panoramic view of Georgian Bay on a clear day. If you experience vertigo, don't look down at your feet and instead look straight across to the other side of the bridge. If you do fear heights, don't go on a windy day as the bridge has the potential to really s-ww-aaa-y. The bridge is little kid safe, though, as it is very well fenced in. If you're on the fence about the gemstone mining package, you should order it for at least one kid. My children really had a blast with it, and were able to take home the semi-precious stones that they "found". Even my husband (and I) were captivated by uncovering stone treasures buried beneath the earth. 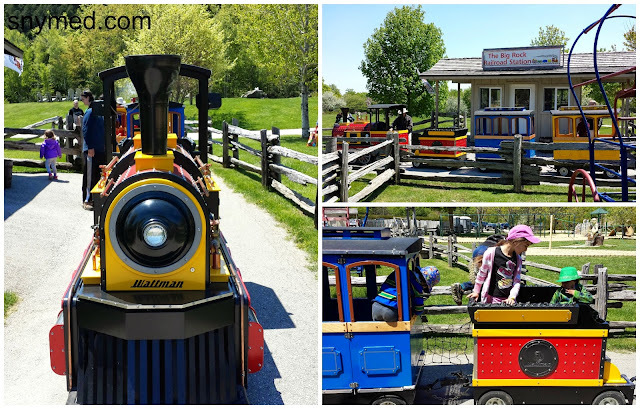 Our kids really enjoyed the Scenic Caves train ride, which is free with admission to all visitors (adults with kids included). If you have a Thomas the train fan, don't miss it! 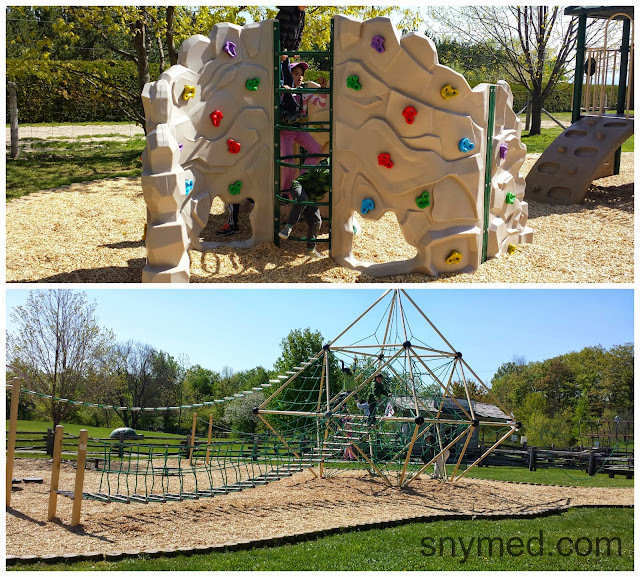 The kids really enjoyed the modern playground at Scenic Caves, and played there a few times during the day. I loved that there was a picnic table nearby, so we could sit and leisurely enjoy our lunch. 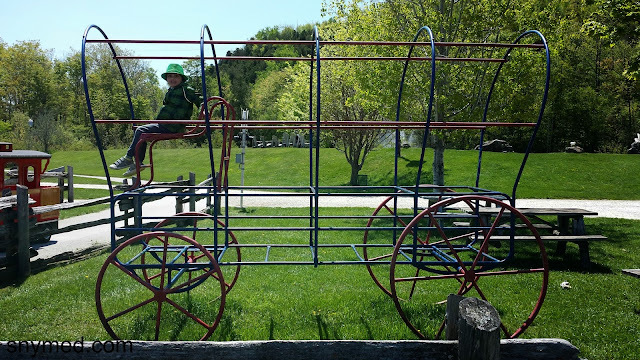 The kids also occupied themselves climbing the pioneer wagon monkey bars, and the turtle near the train ride (not shown). 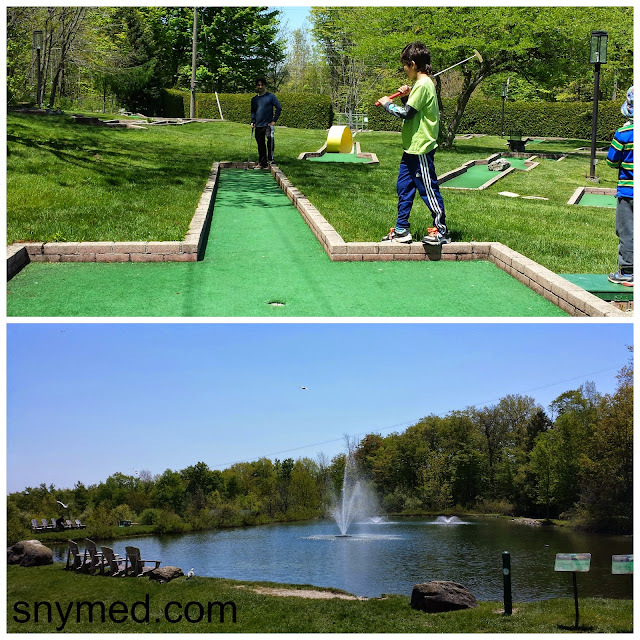 Adding mini golf to our visit, was a great way to extend our day and change gears when the kids were getting a little tired of physical exertion. Who could get a hole in one? Could anyone beat dad? My youngest to oldest kids all loved having their own golf club and ball. Fun! 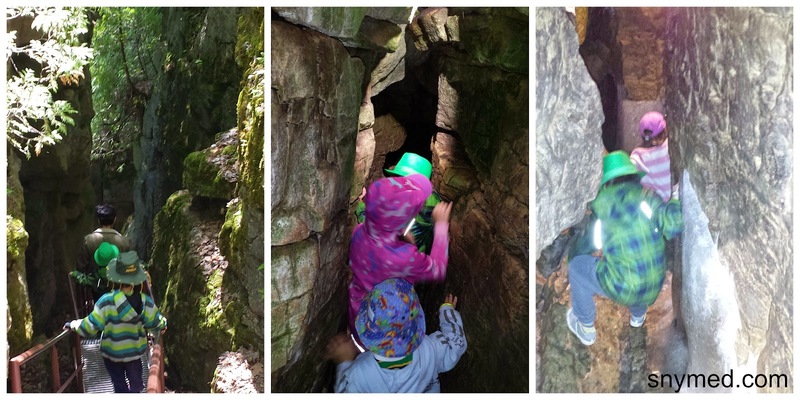 I would recommend Scenic Caves Nature Adventures to families with kids ages 4-years old and up. 6-years old would be a good age to start visiting the caves, and 10-years old is the starting age for treetop walking and zip lining. If you do bring kids younger than 4-years old, as mentioned there are age-appropriate activities for them too. Do bring your teens, or if you're 20-55 years old, visit with a group of friends! 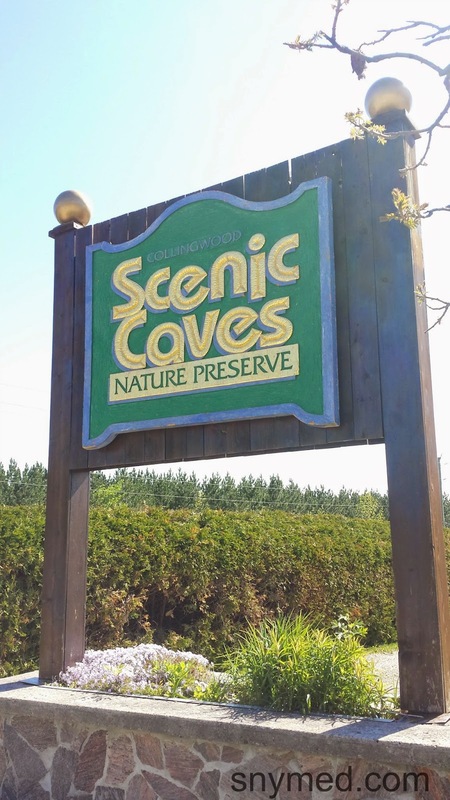 Follow Scenic Caves on Social Media! Do you have any adventurous activities planned for the rest of the spring or summer? Have you ever explored caves before? Spring in Canada is tricky business, and it's difficult to predict what kind of weather to expect. On some days, half of my kids will be wearing winter jackets, while the other half are wearing raincoats. Some could be wearing long pants, while the others are wearing shorts. And always it seems, one is wearing winter boots, another rainboots, a few wearing sneakers, and one in crocs. Oh, and throw in the odd pair of gloves, sunglasses, a neckwarmer, and a sun hat--and this is how we dress for Canada's confusing spring weather! By the afternoon, the weather tends to warm up, but it could quickly turn windy or wet. That's why I never leave the house without a jacket in the months of April or May. 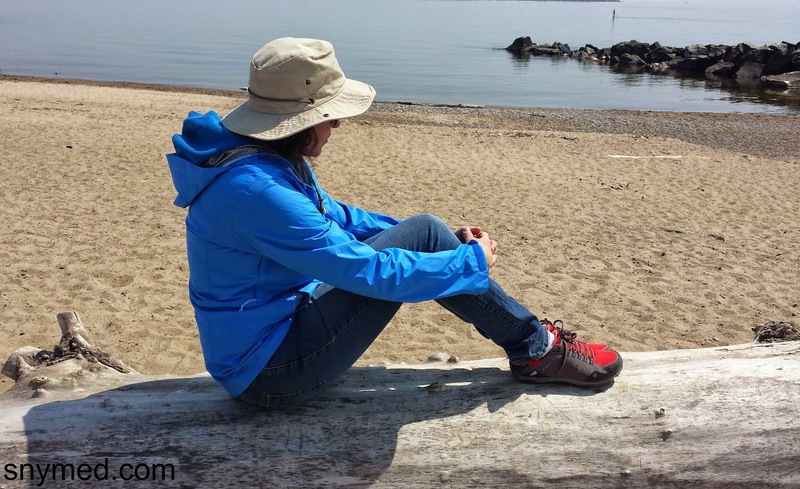 Columbia Sportswear makes the EvaPOURation Jacket, which is a light-weight, no-nonsense raincoat. Yes, it has a hood, with is a prerequisite for any jacket I own for Canadian living. I love that there are zippers beneath the under arms, for quick ventilation. This is perfect for cool days, when the sun decides to peek out. It's also great for running on a rainy day. I do a lot of walking and hiking in the spring. I love to see the new life blooming all around me, and it's uplifting to the soul. 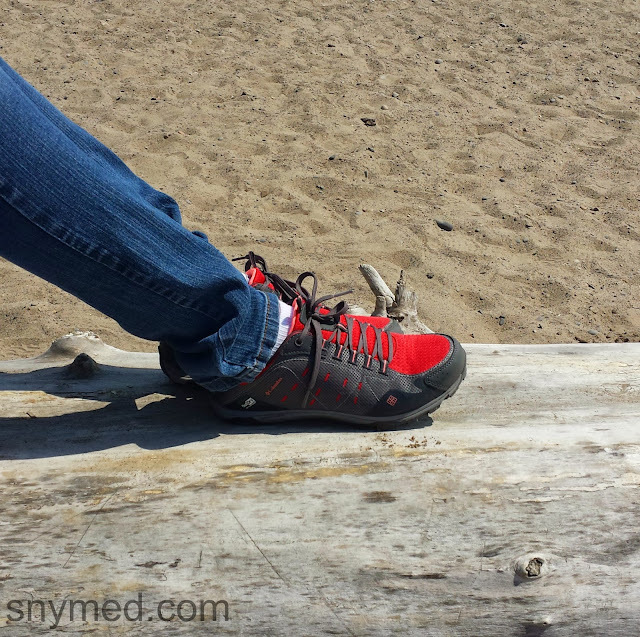 I recently tried out Columbia Sportswear's Conspiracy Razor OutDry shoes in red hibiscus/coral glow. The colour of the shoes really caught my attention, and once I put them on, I noticed that they really gripped like suction cups. Such a sole is important to prevent slipping--if the ground is moist or loose--and also the hallmark of a great pair of hiking or trail shoes. Although a nice shoe, the fit was not for me: a wide, rounded toe that seemed disproportionate to a more narrow shoe. Maybe the fit will work for you? What is spring weather like where you live, and how do you dress for it? If you're in Canada, how do you manage our ever-changing weather? 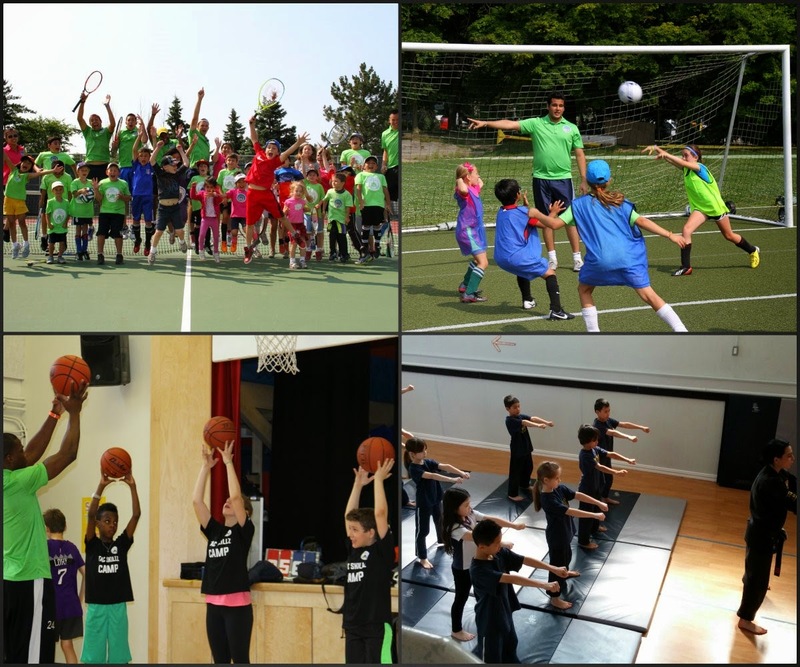 Get Toronto Summer Camp Covered With TAC Sports! Discount Code! If you've checked a calendar recently, you may have noticed that summer 2015 spans 10 entire weeks. While some will consider it a treat to have the kids home for 10 consecutive weeks, others will consider it a challenge. Personally, with 5 kids 4- to 9-years old, I consider it a challenge. My kids need structure during the summer, and a way to keep active the entire day. 2-3 hours of physical activities just won't cut it with them, and I don't want them to fill their days watching tv or playing on the iPad. For my readers in Toronto or the near GTA, I've previously spoken about TAC Sports (Toronto Athletic Camps) for girls and boys. They offer summer camps at 5 different Toronto and GTA locations, including 3 different Toronto locations, Scarborough and Thornhill! Sports include a choice of tennis, soccer, basketball and martial arts--you can mix and match multiple sports for your child! TAC Sports boasts low instructor/student ratio. I like that you can register kids for full- or half-days. Also, hot lunches may be purchased if you wish to simplify the meal process. They also offer March Break camp and Spring Athletic programmes, which I wrote about earlier this year. Curious about TAC Sports camps? Watch their VIDEO, below! Use code SNYMED and receive $25 off any TAC Sports camps or programmes! Don't forget to use promo code SNYMED to get $25 off (good on any TAC Sports camps or programmes)! TAC Sports Camp Registration <--Use discount code SNYMED to receive $25 off TAC Sports! What summer plans do you have planned this year? 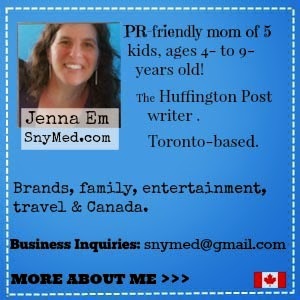 Are you considering camps for your kids or grandkids? 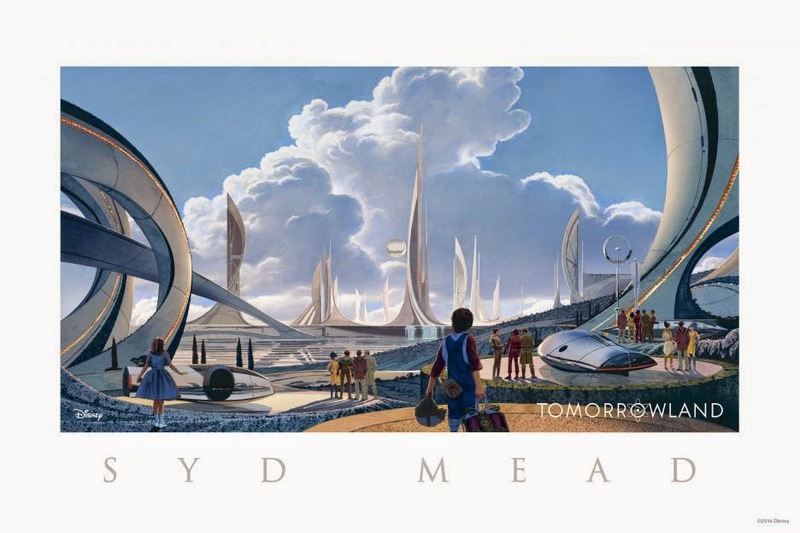 Disney's Tomorrowland In Theatres May 22nd! 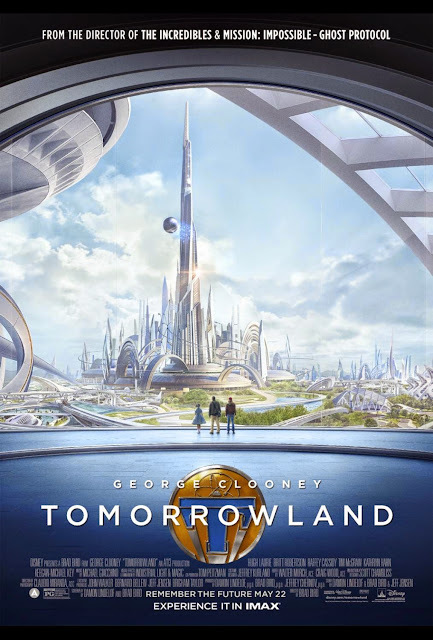 As a lifelong Disney fan, lover of science fiction, and mother of two tweens, I am eagerly anticipating Disney's Tomorrowland movie, coming to Canadian theatres on May 22nd. My daughter has long since transitioned out of the Disney Princess era of her life, and now she wants to see films about teens and their lives. I'm thinking that Tomorrowland with Casey (Britt Robertson), will offer tweens like my daughter a more mature Disney storyline. Adult audiences will instantly recognize George Clooney as Frank the genius. Tomorrowland Synopsis:“Tomorrowland is a riveting mystery adventure starring George Clooney. Bound by a shared destiny, former boy-genius Frank (Clooney), jaded by disillusionment, and Casey (Britt Robertson), a bright, optimistic teen bursting with scientific curiosity, embark on a danger-filled mission to unearth the secrets of an enigmatic place somewhere in time and space known only as “Tomorrowland.” What they must do there changes the world—and them—forever." Watch the VIDEO trailer of Disney's Tomorrowland, below! Follow Disney's Tomorrowland on Social Media! WIN 1 of 2 FAMILY PASSES (4 tickets each) to see an advance screening of Disney's Tomorrowland in downtown TORONTO on Wednesday May 20th, 2015 at 7:30pm, from SnyMed.com! Contest closes on Thursday May 14th 2015 at 8:00pm EST, so be sure to check your e-mails by the morning of May 15th. Leave a COMMENT below, stating the first thing you would do if you could visit the future. Then, use the entry form below to enter the contest. GOOD LUCK!